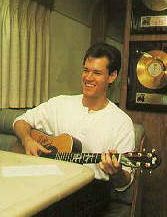 Country music star Randy Travis is a major Andy Griffith fan: He carries a complete collection of The Andy Griffith Show on his bus. So naturally he's thrilled to guest on Griffith's NBC series, Matlock, Friday night (8 EST/PST) . ''Every once in awhile he starts talking and you close your eyes and you'd think he was on the set of the old Andy show,'' says Travis, who plays a hitchhiking house painter Griffith picks up and hires. Of course, it turns out Travis is better at singing than painting, so he and Griffith, an old crooner, team up on a recent Travis song, Forever Together. Travis, 32, who had a bit role in the movie Young Guns and sitcom Down Home, joins the list of country stars making forays into acting, including Reba McEntire, Dwight Yoakam and K.T. Oslin. Is more acting in his future? ''I'm definitely serious about it, but at the same time we're not jumping at everything that goes by. We've had a lot of offers, but it's sort of like music: You do what you want to do, what makes sense to you.'' Randy reprises his role as Billy Wheeler in Matlock episode #134-The Mark.